Author facPosted on June 30, 2017 Categories Uncategorized1 Comment on Justice Committee Evidence Gathering begins today! Author facPosted on February 16, 2017 February 16, 2017 Categories UncategorizedLeave a comment on Ordinary Football Fan? 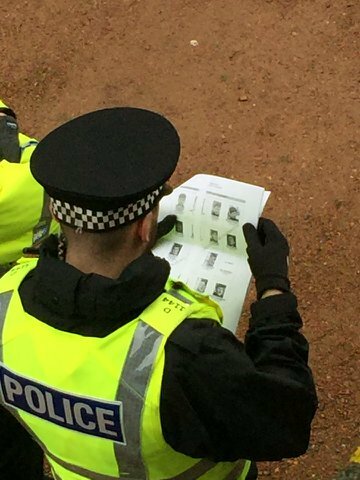 Worried what info the police hold on you? Scottish Government include the Offensive Behaviour Act in Review of Hate Crime! I am satisfied that the evaluation meets our commitment to report to Parliament on the act’s effectiveness, and that it presents a strong, diverse and representative set of views, reflected through a robust and independent evaluation process. At the time, FAC, disputed that this ‘review’ met the terms of the amendment to the Act when it was passed and petitioned Parliament for a full and transparent review. The government, and its supporters, continually argued that they had done this. Since that time, and particularly since the SNP lost their overall Parliamentary majority in the 2016 elections, the situation has moved on. In particular, we how have a Private Members’ Bill proceeding through Parliament which would repeal the Offensive Behaviour Act. It has already completed the public consultation stage in which anyone who had a view on the OB Act was invited to contribute. This exercise, which elicited the largest response to a public consultation ever in the history of the Scottish Parliament, showed that over 70% of respondents were fully supportive of the repeal of the OB Act. 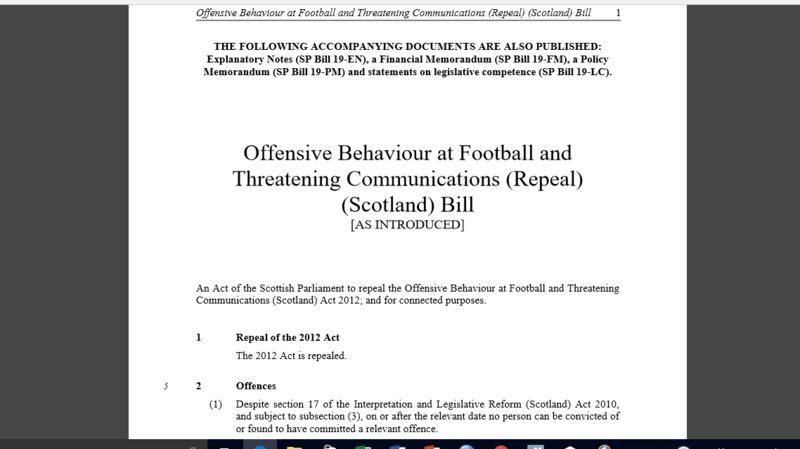 Perhaps more importantly, in early November 2016 we had a vote in Parliament on a motion put forward by the Tory, Douglas Ross MSP, to support the repeal of the Act which was supported by every opposition MSP (bar one who was ill) (Government defeated in Offensive Behaviour at Football Act Vote) . While this vote was not binding on the Government it represented the clear view of Parliament and required a response from the Government. To date no response to that vote has been given – the SG are acquiring a bad habit of ignoring votes in which they are defeated apparently. In normal circumstances, Kelly’s bill would have made its way to a Parliamentary vote and the expected repeal of the Act by the end of this Parliamentary session – June 2017. Thursday’s announcement of a review which is expected to take a year from this Monday (30/1/17) then is quite shocking in this context as it appears to be an attempt to delay the process and thwart the will of Parliament. The bare-faced cheek of a government planning to review a piece of legislation which it adamantly maintained it had already done in June 2015 is breath-taking. Bear in mind, that a further year’s delay will mean more and more young fans receiving criminal records that they would not otherwise have done and all fans having to suffer the oppressive policing which this Act has engendered. Strangely, she didn’t tell us exactly who she was referring to. She then spoke of the need to defend ‘civil liberties and human rights’ knowing full well that Liberty, the foremost civil rights organisation in the UK and BEMIS, the national ethnic-minorities led umbrella body, both contributed searing indictments of the Offensive Behaviour Act to the public consultation in October 2016 – not three months ago! This interpretation of the Act goes way beyond anything the Scottish Government has said publicly ie that it is aimed at the fans of only two clubs and that it ‘focuses’ on their political views and, indeed, ethnic and cultural background. Clearly the noble Lord has no problem with interfering with the civil and human rights of the two groups he identifies. Let us be clear. We are not opposed to a review of hate crime legislation and, indeed, all legislation should be reviewed periodically. However, anyone who doesn’t see that this is yet another anti-democratic, spiteful tactic by the Scottish government, which penalises football fans yet again, simply doesn’t want to see it. We demand that the Kelly Bill proceeds through Parliament as normal and we call on all democrats to raise questions with their MSPs if it does not. For more than five years we have engaged with every democratic process and every peaceful means of protest in our opposition to the Offensive Behaviour Act. We won’t be backing down now. Author facPosted on January 28, 2017 January 28, 2017 Categories UncategorizedLeave a comment on Scottish Government include the Offensive Behaviour Act in Review of Hate Crime!